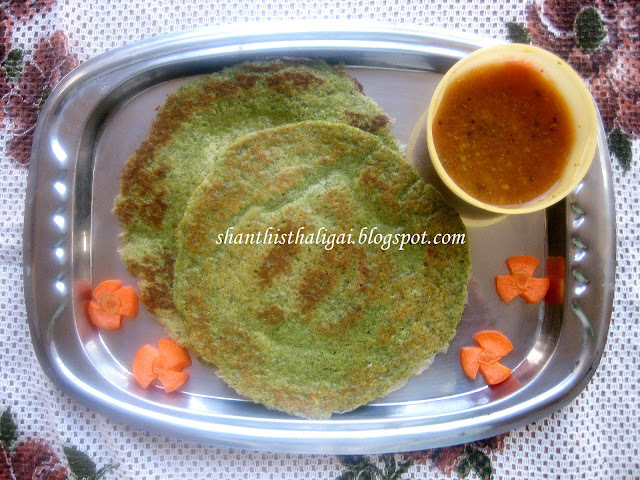 Celebrating my 250th post with an Andhra breakfast recipe using whole green gram dhal. Wash and soak green gram dhal and rice in water overnight. Drain the water completely and grind it coarsely( like adai batter) alongwith green chillies, coriander leaves, ginger and cumin seeds. Mix in the salt, chopped onions and curry leaves. Heat a tawa, spread the batter, drizzle oil on sides, and when done flip it to the other side. Again drizzle oil on sides and cook till crispy and golden brown. Serve hot with any chutney. As I had some sambhar, I did not make any chutney. Thanks for visiting my blog. Your pesarratu looks perfect and yummy. Congrats on your 250th post. Pesarattu looks yummy. congratulation on the 250th post. its really an achievement..love the pesarattu..really healthy. Congrats on your 250th post, pesarattu looks too good. Congrats !!!!!! !Wish you all the best.Nice way tocelebrate. Pesarattu photo romba ve nanna irukku. Kadamba saadam kelvi patturken aana panninathu illai. Kattayama try pannanum. Thanks for the recipe. Congrats on your 250th and waiting for another 250 soon! Pesarattu looks good - I make this at home as green dosa, yellow dosa etc. Congrats...keep growing..u r queen of veg dishes..Wish to try more n more recipe..
Congrats on ur 250th post .Just keep rocking.The pesserete looks absolutely delicious and nice. wow same sweet I also made pesarattu yesterday.. Ur pesarattu looks delicious and tempting.. Many congrats on your 250th post.Your pesarattu looks lovely.We call these pudlas. Congrats on your 250th post!!! Pesarattu looks delicious. Pesarattu is a indeed a rich breakfast to start your day. Looks yumm in the picture. OMG, I cannot believe this is ur 250th post..Congratulations on this milestone and looking forward to many more recipes..Great way to celebrate this achievement by this healthy and delicious post. I have had Pesarattu before and I love it...Keep Rocking Shanthi.. Many congratz on ur 250 posts! this dish looks really yummy! Congratulations on your 250 posts... wow, thats great!! :):)... wish you many many more!! peasarttu looks delicious with the sambhar!!! congratulations for the 250 posts!!! nice collection! !